There are two types of people: those who have lost data, and those who will lose data. If it has happened to you, you know how painful and frustrating it can be. If not, it’s just a matter of time. Sooner or later, something will go wrong and an essential file will disappear. That something could be anything from a major catastrophe (theft, fire, hurricane, zombie apocalypse) to a random software bug, a cat walking across your keyboard, or even user error (it happens to the best of us). That’s why I’ve been preaching the importance of good backups for years—in books, articles, interviews, and talks. So it’s only fitting that the very first book I’m releasing under the Joe On Tech brand has to do with backups. 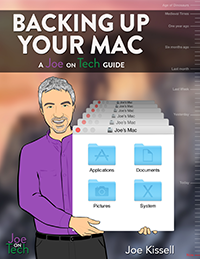 I’m delighted to announce that Backing Up Your Mac: A Joe On Tech Guide is now available in both paperback and ebook forms. It’s the definitive guide to Mac backups, based on more than a decade of thinking and writing about the subject. If you’re a Mac user and you aren’t 100% sure you could recover all your data after any disaster, you need this book. It costs $9.99 as an ebook or $14.99 on paper—and, if I may say so, that’s a small price to pay for the peace of mind that comes from knowing your data is completely safe. The information in the book will save you time, money, and effort. And it’s backed by my personal, 100% money-back guarantee. So please drop whatever you’re doing right now (unless it’s, like, handling dangerous chemicals) and buy my book. Then you can come back and read the rest of this article. I’ll wait. OK, welcome back. You may have some questions that weren’t answered on the book’s web page, so allow me to offer an extra mini-FAQ. Q: So, Joe On Tech guides. Is that a thing now? A: It’s a thing. This is the first of what I hope will be many books on tech topics published by my own company, alt concepts inc. Currently the plan is to release additional titles in August, October, and December. I won’t be keeping up a book-every-two-months schedule forever, but I have several titles I want to deliver in relatively short order. Q: Is this related somehow to Take Control? A: Sort of! 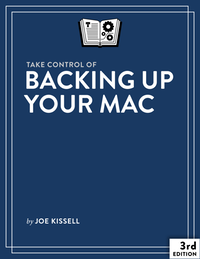 This book is a thoroughly revised and expanded version of what used to be Take Control of Backing Up Your Mac. That was always one of my favorite Take Control books (not to mention a best-selling title), but it’s gotten kind of long in the tooth and there just wasn’t space in the Take Control publishing schedule to keep it updated anymore. So I offered to “adopt” this title (and several others). I hired my own editor (Caroline Rose, who has edited many Take Control books), tech reviewer (Dan Frakes, formerly of Macworld and now at The Wirecutter), artists (Nitrozac & Snaggy), and cover designer (Darren Johnston), and I’m publishing the books myself. The old book has been retired, and this one replaces it. Take Control Ebooks is functioning as a reseller for me, but you can also buy the book directly from me (the best choice, in my opinion), or from the iBooks Store, Amazon, Leanpub, and so on. Q: If I already have Take Control of Backing Up Your Mac, do I also need this book? A: Probably! My most recent Take Control book on Mac backups was last updated in 2013. This new book is up to date with the latest info on both Yosemite and Mavericks, not to mention the latest backup hardware, software, and services. Plus, it has an entire chapter devoted to helping you reassess an existing backup plan. I should also mention that the new book is half the price of the old one! And I’ll be able to keep it updated more easily as the Mac backup landscape changes. Q: Are all Joe On Tech guides going to be recycled versions of Take Control books? A: No, but the first few will be. In the coming months, I’ll be releasing Joe On Tech guides about maintaining, troubleshooting, and speeding up Macs, all of which will reprise (and replace) earlier Take Control topics. After that, I plan to create new-from-scratch Joe On Tech titles that will cover entirely new territory, and won’t be geared exclusively toward Mac users. Q: Are you going to continue writing Take Control books too? A: Yes! In fact, I’m writing my 51st Take Control book right now. As long as it makes sense financially, I’ll keep doing it. Any other questions? Hit me up on my contact page. Update: Here’s a MacVoices video interview I did with Chuck Joiner about the new book. Enjoy! 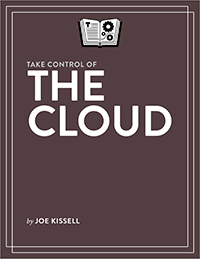 In Joe On Tech, best-selling tech author Joe Kissell offers fresh perspectives on improving your relationship with technology. To learn more, read The Joe On Tech Manifesto or visit the About page. NEW! 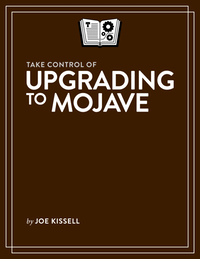 Upgrade confidently to macOS 10.14 with Take Control of Upgrading to Mojave. 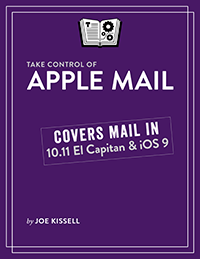 Master your email and solve Mail problems with Take Control of Apple Mail. 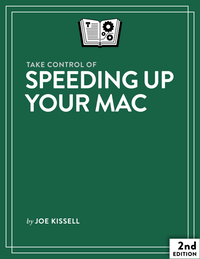 Turn a slow Mac into a high-performance machine with Take Control of Speeding Up Your Mac. 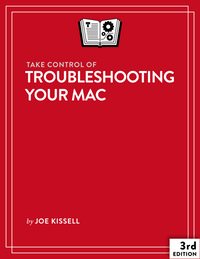 Solve common Mac problems without a trip to the Genius Bar with Take Control of Troubleshooting Your Mac. Keep your Mac running smoothly and prevent problems with Take Control of Maintaining Your Mac. Safeguard your Mac’s data while saving time, money, and effort with Take Control of Backing Up Your Mac. Discover the best ways to use Apple’s cloud services in Take Control of iCloud. 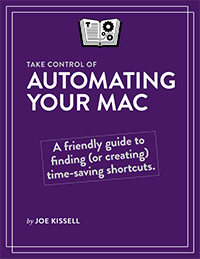 Find easy shortcuts to everyday Mac tasks with Take Control of Automating Your Mac. Wrap your head around the wide variety of cloud services and apps with Take Control of the Cloud. 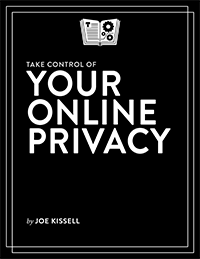 Keep personal information out of the wrong hands with Take Control of Your Online Privacy. 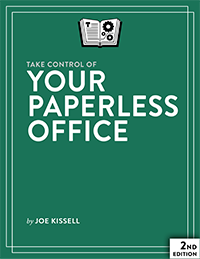 End the paper avalanche and scan your way to bliss with Take Control of Your Paperless Office. 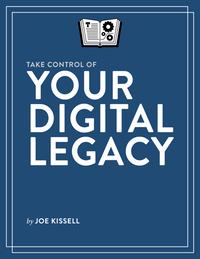 Preserve your essential data for future generations with Take Control of Your Digital Legacy. © Copyright 2019 alt concepts inc. All Rights Reserved.